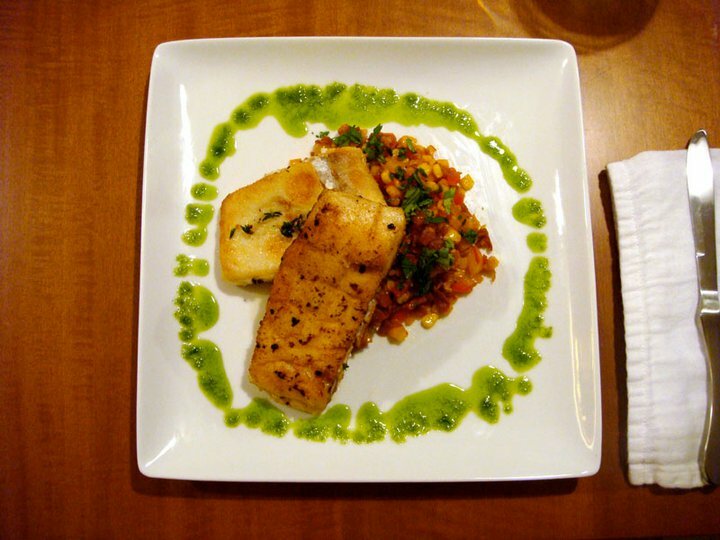 Sea Bass and Succatash — Top Chef All-Stars Night | Eat.Drink.Life.Love. It’s one helluva a winter here in Minnesota. So far we’ve had about 59 inches of snow and many, many days on which the windchill is below zero. We couldn’t really get out on a boat and catch our own fish like the Top Chef All-Star contestants did. Nor could we find sea bass so we went with the similar (and sustainable) halibut. Purchased from the fish counter at the store after running, freezing, through the icy parking lot. But what to do with our halibut? We’d hoped to make Dale T.’s fish tacos but Bravo didn’t post that recipe. We were going to try Carla’s smoked fish lettuce wraps, but smoking fish indoors wasn’t going to work for us and if we purchased pre-smoked fish then we were just assembling lettuce wraps. One of the few posted recipes was for Richard, Fabio and Marcel’s clunker — sea bass, succatash, corn puree, tomato confit, concord gastrique and jamon air. The team was (rightly) dinged by the judges for overly complicating what could have been a good, simple dish so we decided to un-complicate it. We stuck with just three elements — the roasted fish, succatash and chive oil. K started with the chive oil which basically consisted of blending chives and olive oil together, heating it up and leaving it to cool. Done and done. Then we both started prepping the succatash. Fresh corn is virtually impossible to find right now so we used organic frozen corn and steamed it with a little water. We chopped red and yellow peppers, garlic, shallot, tomato, cilantro and prosciutto. Our soundtrack for this was K’s old skool iPod which cranked out everything from crusty punk to Journey. K cooked the garlic, shallots and prosciutto while I got started on the fish. I used a mixture of butter and olive oil in place of ghee and coated the fish with semolina flour. I started searing the fish and, when it needed to be flipped, added a bit more butter, some garlic and some thyme. The filets were thick and took longer than I thought they would. K, in the meantime, had added the remaining succatash ingredients to the pan and everything heated through quickly. He tossed in some lime juice, cilantro and paprika, I squeezed some lime juice on the fish and boom — it was time to enjoy our culinary journey to the beach. The flavors of the succatash were bright and the veggies popped with flavor while the prosciutto added depth. The fish needed *a lot* more lime and salt to really bring its flavors out. Strangely, the chive oil — which we thought was going to have strong onion flavor — really didn’t add more than color. The succatash we’ll definitely be making again, probably as a side dish or salad in the summer (and with fresh corn … YUM). There are more interesting ways of making fish so we’ll look for them next time we’re in the market for a fish dish. Incidentally, the house smelled like halibut for a week after we made this dinner. I tried boiling cinnamon and cloves on the stove to get rid of the odor, but when K came home he said, “Why does it smell like fish and patchouli in here?” If anyone has an effective method for destroying fishy smells, let me know!